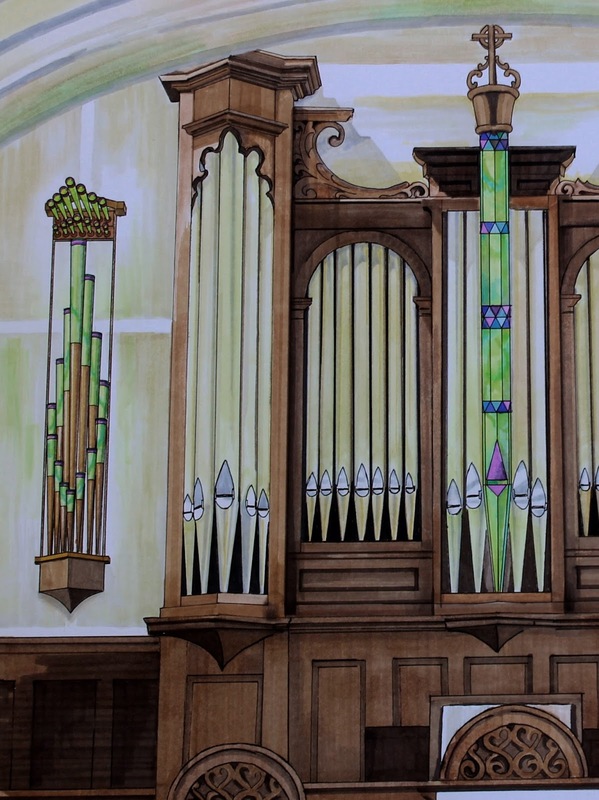 We love to create new visual, tonal, and technical blue prints for existing organs that are tailored and innovative - yet securely founded in the history, engineering, and fine art of pipe organ building. These are passion projects for us, often infiltrating our dreams with visions of breathtaking instruments that don't yet exist - but could. 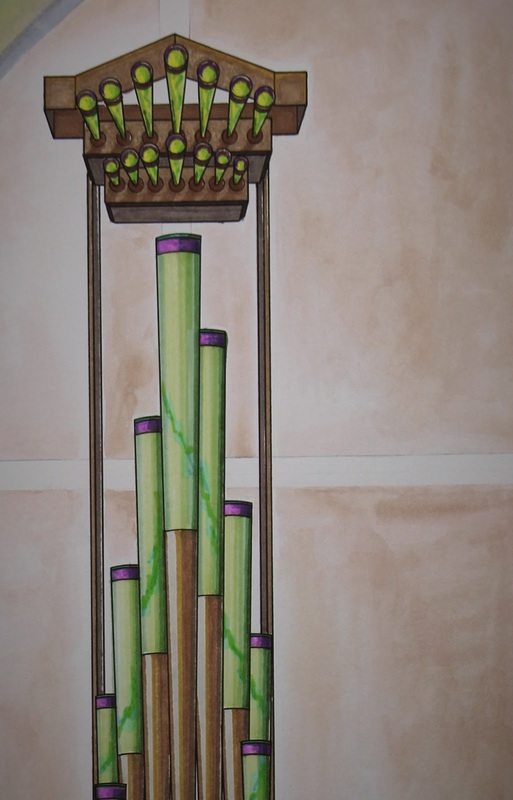 Imagine a 1860 Simmons and Wilcox pipe organ with the addition of a glass trumpet stop and a focal pipe in faceted glass. These drawings help us imagine what it could be like, but do little to show the actual luminous and remarkable quality of the glass, and nothing at all to show the quality of sound that would be produced. But we can imagine it together. 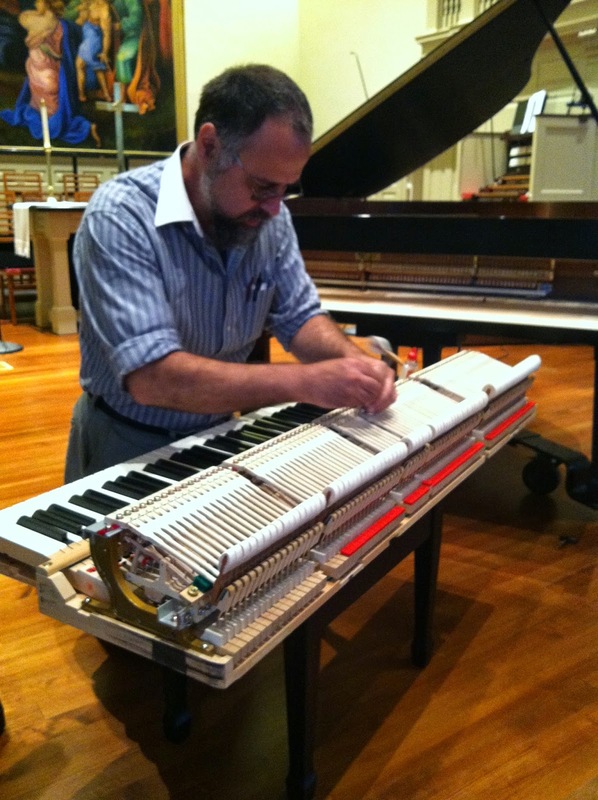 This historic instrument was painstakingly rescued and carefully restored. Some of the many changes made along the way include the addition of several new stops to more fully meet the needs of it's current congregation. Carved beef bone covers replace the missing original ivory. A new wind chest was constructed with several new stops. The pedal stops were expanded, and changed to operate electrically. Bellows pumped by hand were replaced with an electric blower, and the original mechanical system was replaced with a modern electro-pneumatic stop action, plus a modern combination system that allows the organist to store and use various tonal combinations. 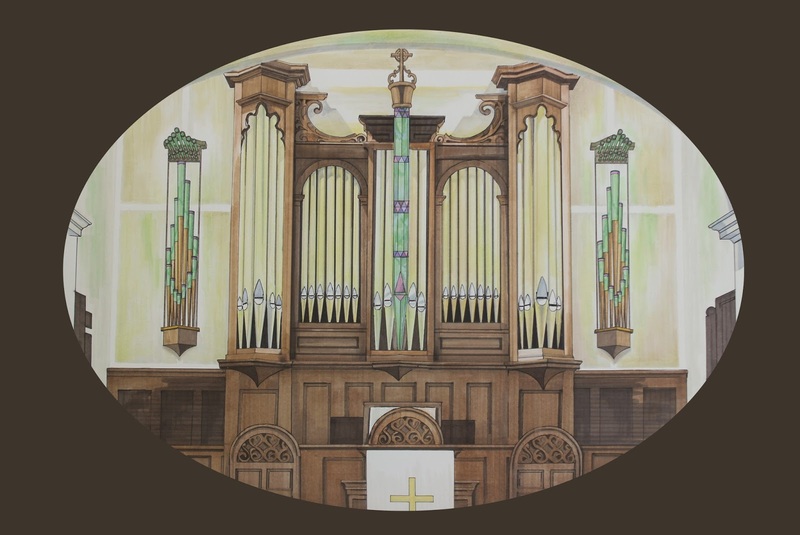 This instrument is a perfect example of the many historic innovations in pipe organ building through the years, and as such, it is a ever-evolving work of fine art and craftsmanship. In fact, most pipe organs of this age are a Frankenstein-like amalgam of old and new, but this is not to be considered a flaw. Rather, this is a celebration of the many gifts of innovation God has given His people through the centuries, each one building on the last. Innovation is written all through this jewel of an instrument as if it were written on the pages of a book. The exceptionally beautiful chestnut casework of this instrument is at home in a church where there are glorious stained glass windows along the other three walls of the sanctuary and in the ceiling. 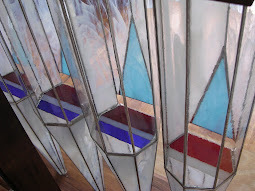 The front wall of the sanctuary is the only place there is no art glass. 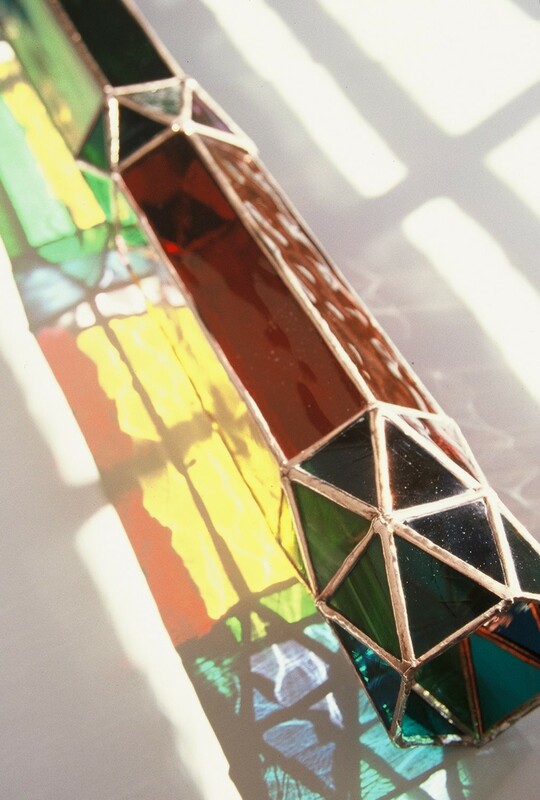 Adding a glass stop and a faceted glass focal pipe would be a history-making addition that would bring the sanctuary into visual (and musical) harmony and balance. 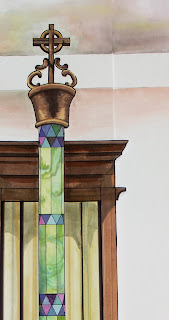 The colors of the glass were chosen to match existing art glass in the sanctuary, and the proposed design is as modern as the electro-pneumatic stop action while being respectful of centuries of pipe organ history. 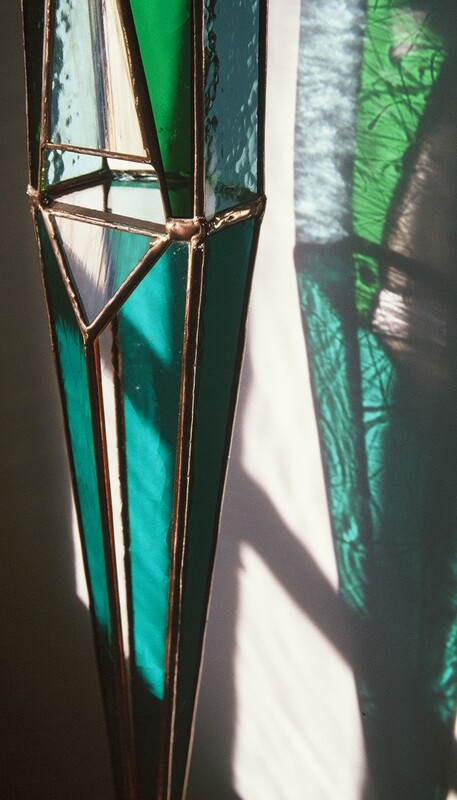 Our drawings fail miserably in showing the luminous quality and flowing movement in the glass, or the impact that light and reflections have in a sanctuary. Perhaps most importantly, we have personally experienced this congregation's friendly and open spirit toward guests. Their genuine warmth uniquely qualifies them to be hosts to the many people who will join them to worship God and to experience this historic instrument. We believe the spiritual gift of warm hospitality that exists in this congregation is the final piece to this puzzle, and by far the most important. 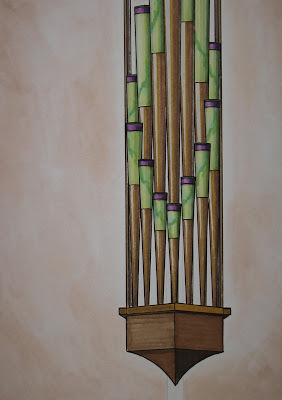 At the heart of our work as pipe organ builders is the desire to release God's beauty in the earth. We facilitate worship by taking good care of the instruments we serve, and supporting the musicians that play them. 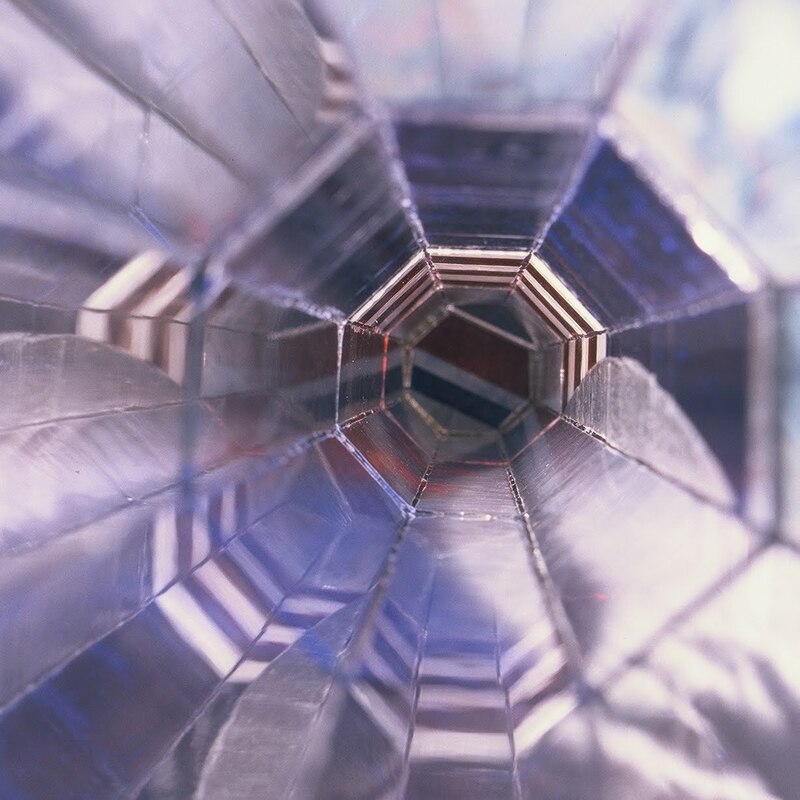 We release God's “lux aeterna” through our innovative work with glass and we gratefully respect and exercise the gifts of innovation and beauty that we have been given. 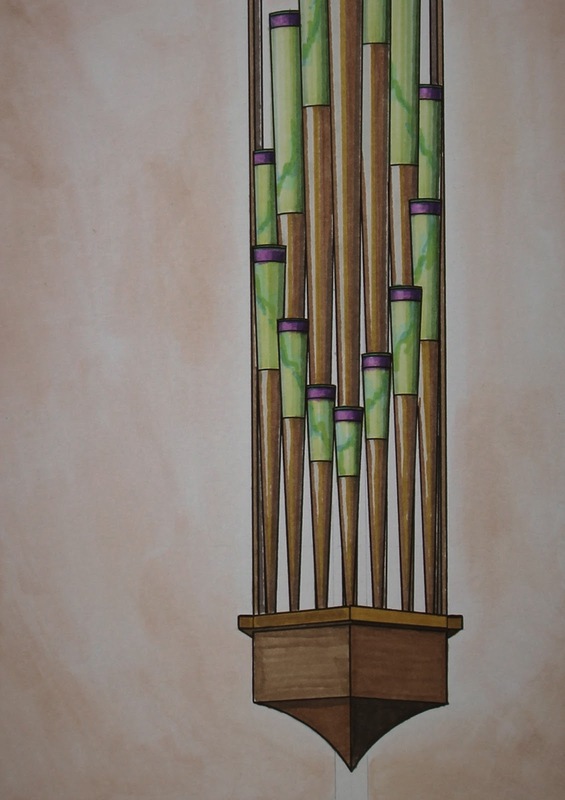 There have been many innovations in the last five centuries of pipe organ building, many of them represented in this single instrument as it has evolved. The addition of the trumpet stop along with the center faceted glass pipe would be a history in the making. Together we can release light, beauty, and grace into the earth. 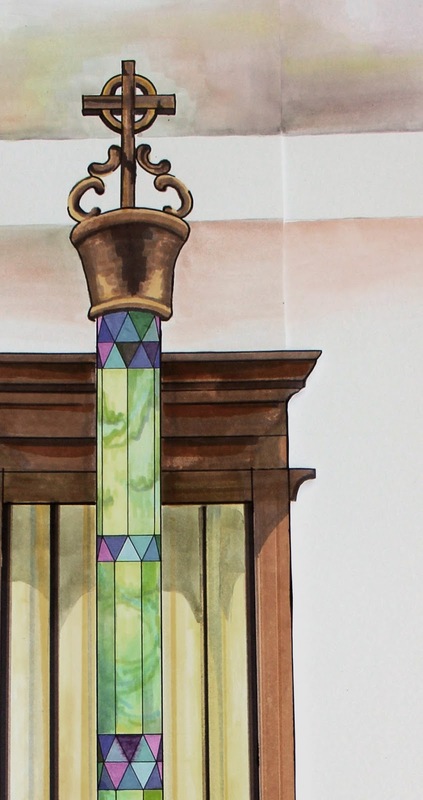 Bringing glass into pipe organ design unites the stained glass and instrument visually. 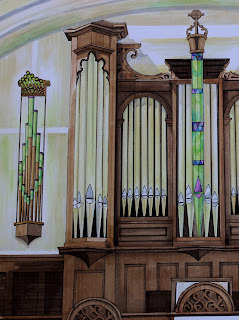 Contact us to imagine a glass addition to your existing or new pipe organ. We are happy to visit your site and dream with you. Thank you for taking the time to visit our website and consider our work.